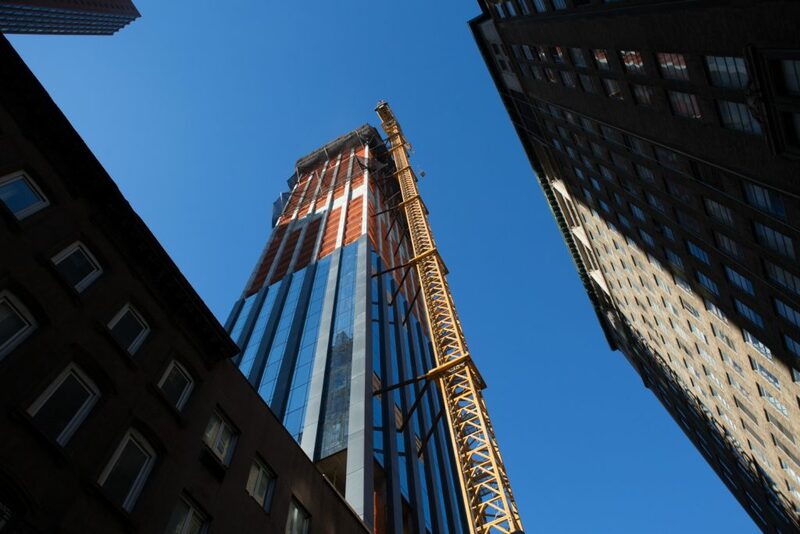 Last week, YIMBY was the first media outlet to be given a tour of the sales gallery and construction site of the 55-story skyscraper at 277 Fifth Avenue, in Nomad, Manhattan, a project which we have reported on extensively over the past several years. 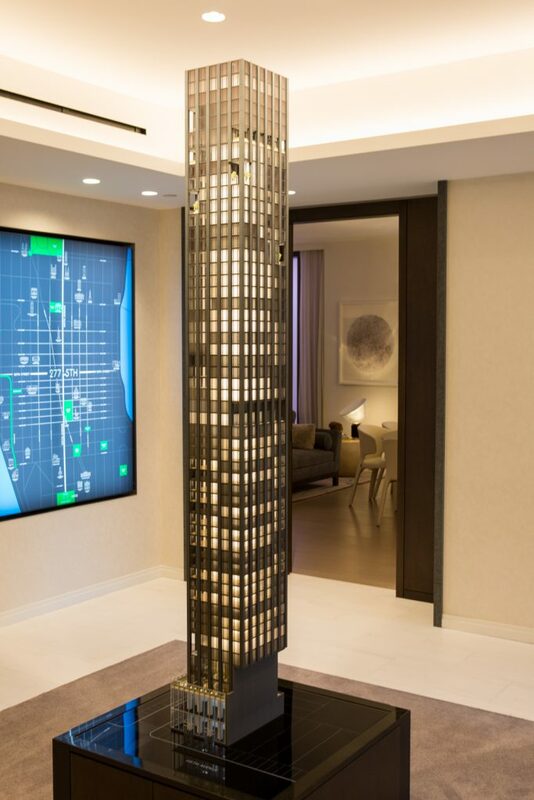 Designed by Rafael Viñoly, the high-rise is currently on its 46th floor, with only nine to go before topping-out occurs. 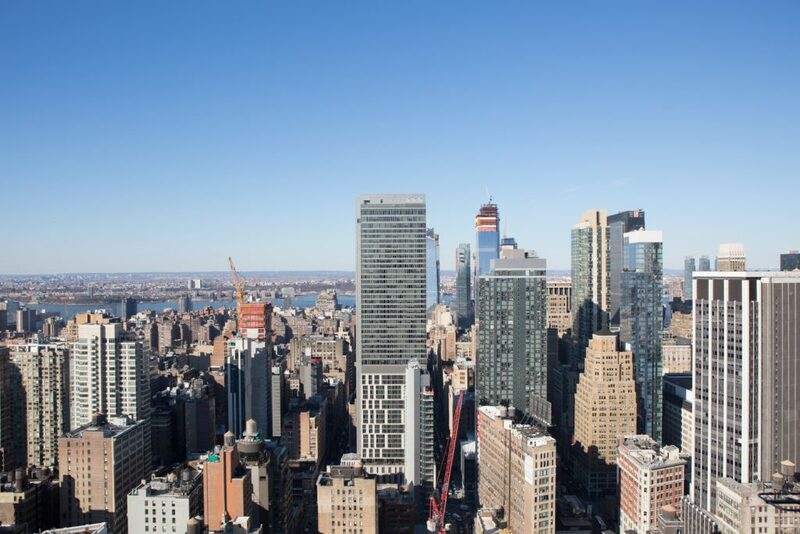 After a nerve-racking elevator ride outside of the building, we stepped out to what is currently its highest floor, which already offers expansive views of the New York City skyline. 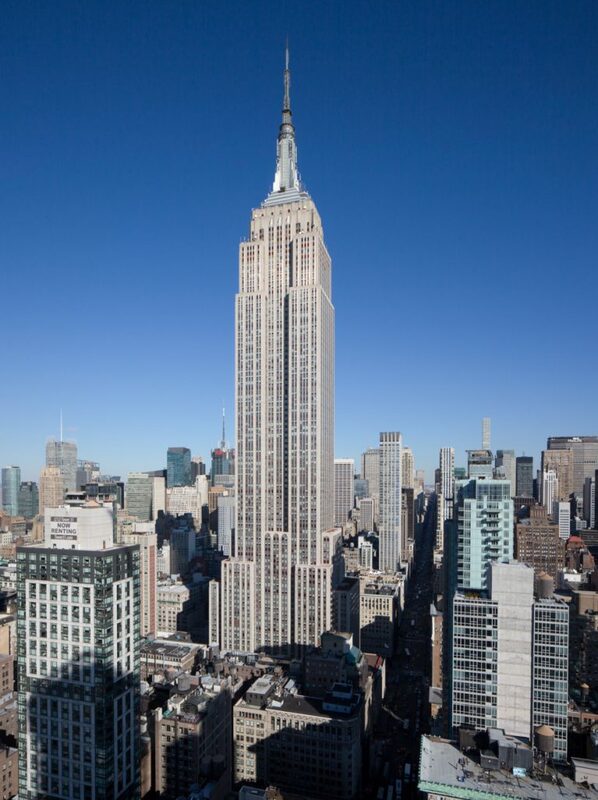 The building will have unobstructed views of the Flat Iron building, the Empire State Building, Chrysler Building, Downtown Manhattan, Brooklyn, New Jersey, and both the East River and Hudson River. All 130 condominiums will have at least one usable corner. Residences also start at the eleventh floor, giving each unit the benefit of a view. Four double-height loggias will be created, one on each corner. Seen below is the loggia on the 46th floor. The loggia is a sheltered, open-air space that allows for uncompromised facade design, as well a terrace that will not scare those who are scared of small cantilever decks in high-rise apartments. Of the three Penthouses created, the highest two will occupy a full floor. They will also benefit from an outdoor spa on their respective loggia terraces, which will span the full width of the building. The first two floors are dedicated to retail space. 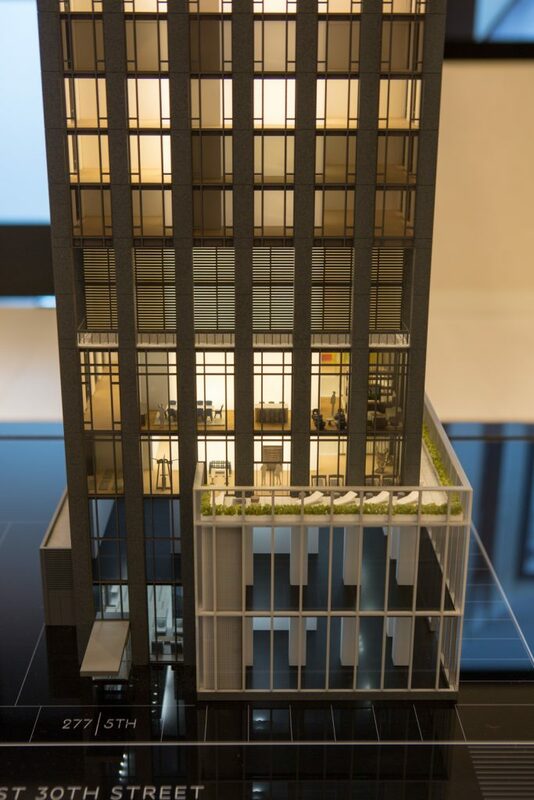 Above that will be a two-floor amenity suite that includes an entertainment lounge, separate bar and catering pantry, private dining room, children’s club, gaming lounge, fitness center, and a landscaped terrace along Fifth Avenue. There will be a full-time doorman, porter services, live-in resident manager, private storage, pet priority program, dry cleaning, and vehicle concierge. In the sales gallery, there are mock-ups of the kitchen, living room, powder room, and bathroom. 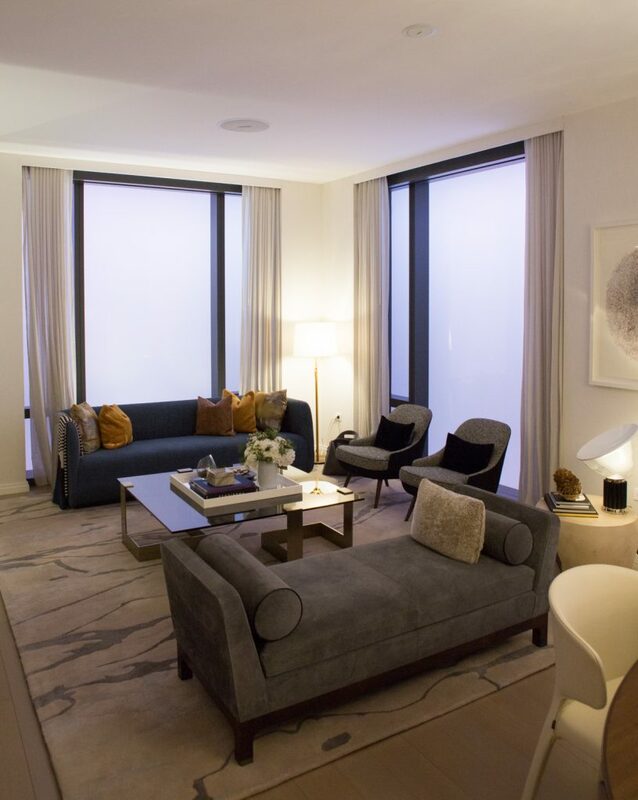 Jeffrey Beers is responsible for the minimalist interiors, endowed with 10-11 foot ceilings and large windows. Each residence will also have a laundry closet with washer and dryer units. Kitchens will have white Oak cabinetry, stainless steel cooking appliances, and marble countertops. 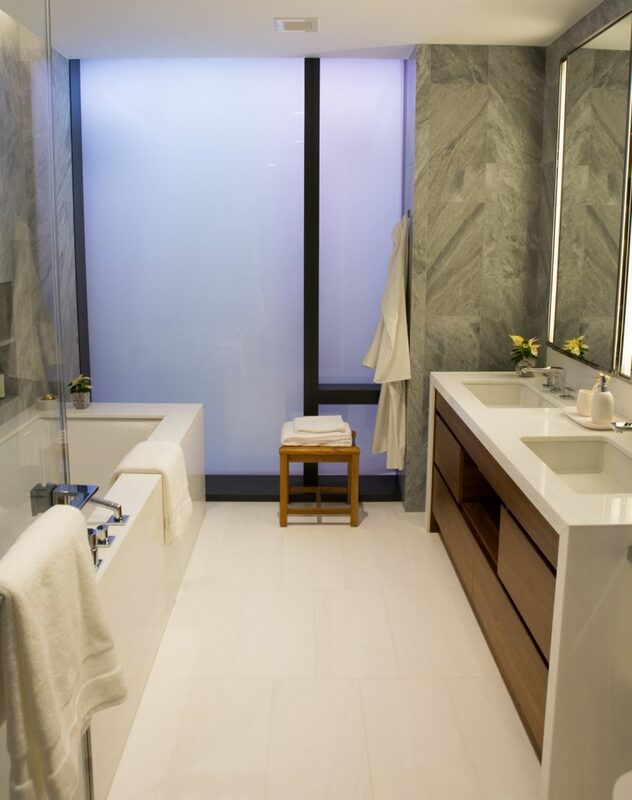 Bathrooms will also have views. Steel enamel tubs are positioned to optimize one’s ability to relax while enjoying their view, with curtains also provided for those who are more shy. 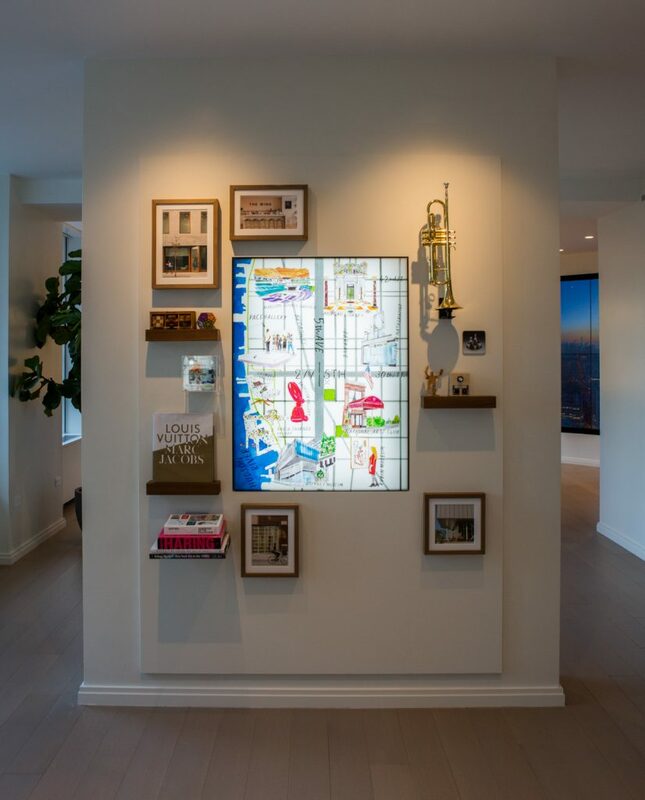 The surrounding neighborhood of NoMad is famous for its historical roots and cultural attractions, which is part of what the sales team boasts. 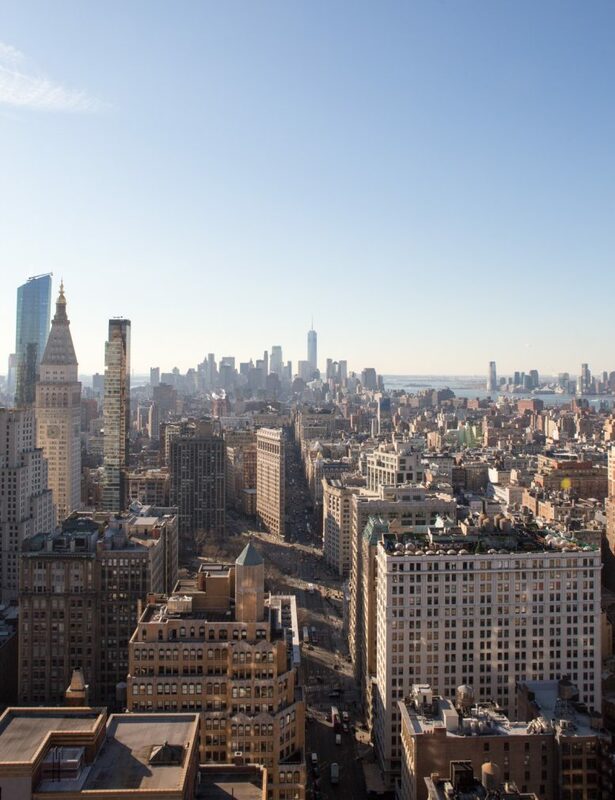 The Flat Iron building is just a few blocks away, and to the west, Chelsea and its galleries also beckon. The shorter sibling to Viñoly’s 432 Park Avenue has a dark-indigo façade made of reinforced cast concrete panels, fabricated in Finland. 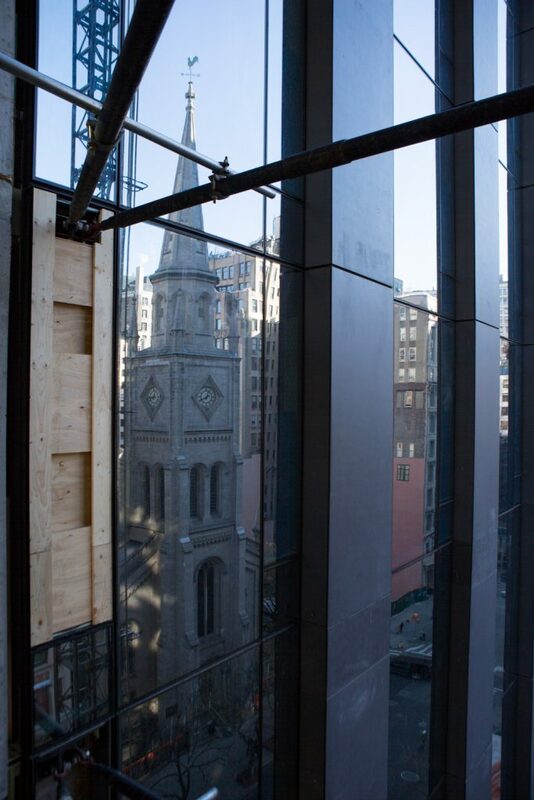 Multi-layered glazed curtain walls were designed for optimal thermal and acoustical performance. 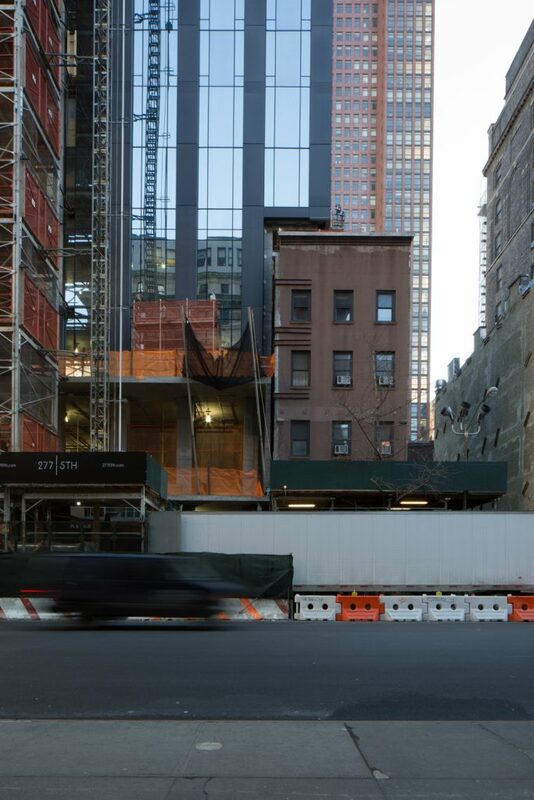 The structure does include a cantilever over a building on Fifth avenue. Victor Group and Lendlease are responsible for the development. 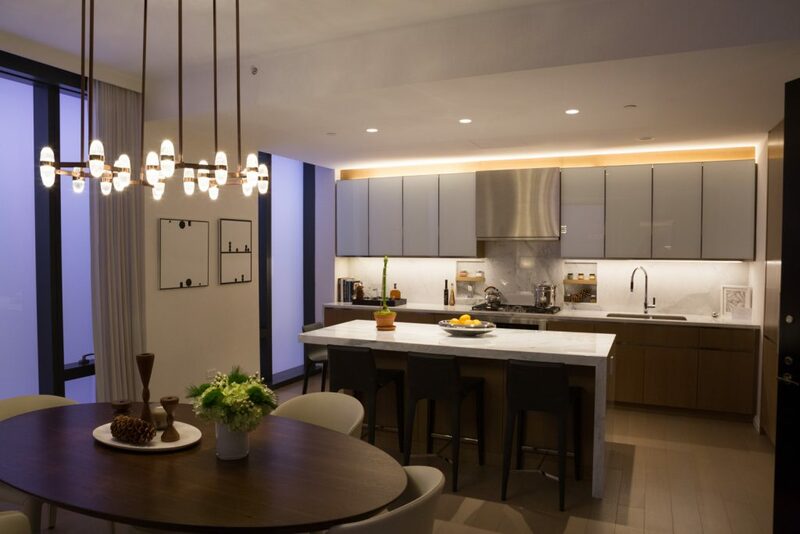 The one-to-four bedroom units range from 828 to 4,520 square feet, and pricing starts at $2 million. Construction is expected to top out in February, with move-ins expected to begin at the end of 2018, and wrap by mid-2019. 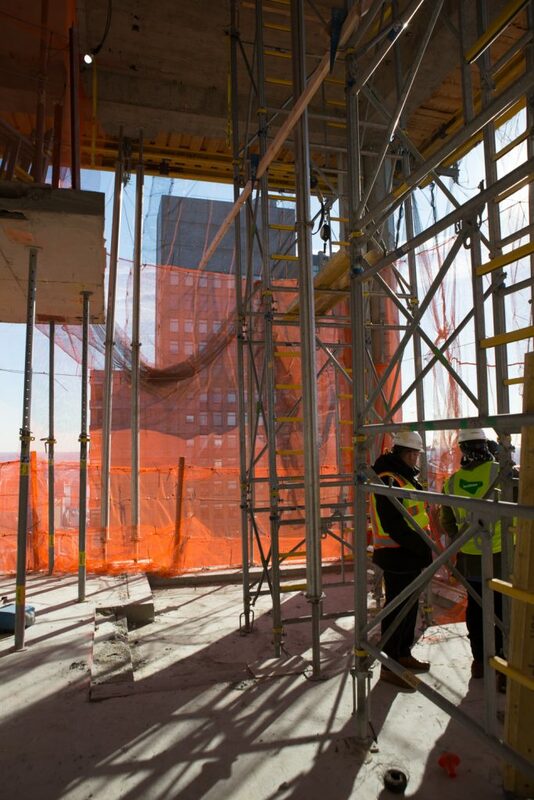 4 Comments on "Exclusive First Look Inside Viñoly-Designed 277 Fifth Avenue, NoMad"
Why are they procuring precast concrete panels from Finland? It seems insane to be hauling cement, aggregate and water across the Atlantic when the US has a perfectly competent precast concrete industry. 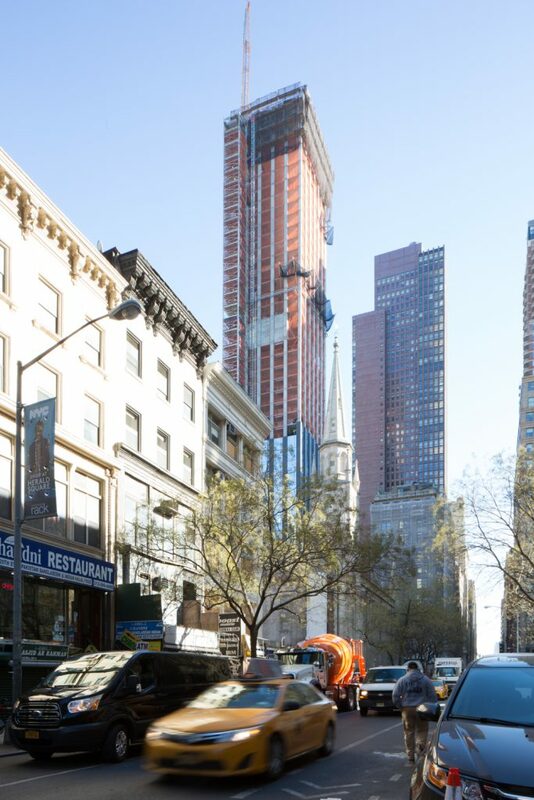 This building will be a lot more hemmed in when all the development nearby is completed: Bancroft site across 5th; Russian supertall at 29th and 5th; towers at 31st and Madison, 28th and 5th; Virgin and Four Seasons hotels near Broadway. Also 2 towers (32nd and 31st both and 5th) will block some of the Empire view. And this list isn’t even exhaustive. 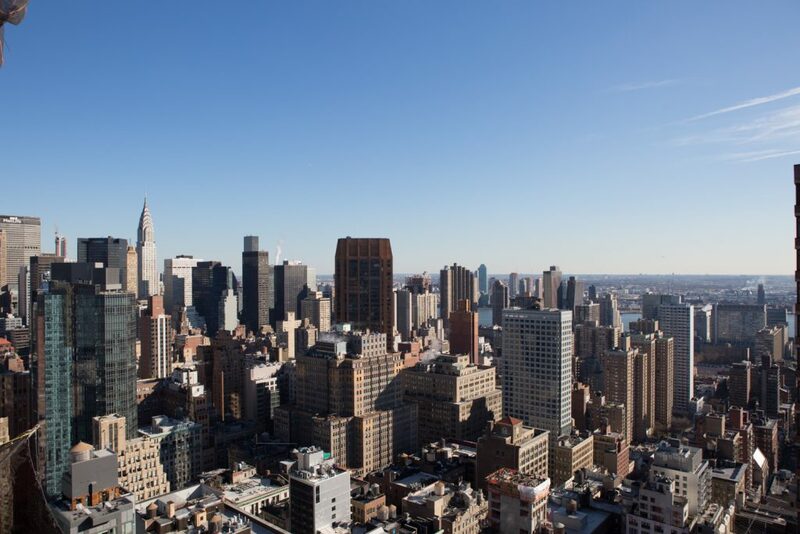 The Fifth Avenue corridor is booming, though views to the South should remain unobstructed. The blocks to the north, however, are imminently going to become a very solid skyscraper canyon with height only rivaled by the densest blocks of Midtown/FiDi. Fifth Avenue seems to be activating to “supertall” status all at once, from the upper 20s all the way to future sites like the Helmsley redevelopment/520 Fifth, and 666 Fifth.